The UK has sent an aircraft to South Sudan to evacuate Britons amid fighting following a reported coup attempt. The Foreign Office said British nationals in the country should make contact if they wish to leave from Juba airport on Thursday. There has been fighting this week in the capital Juba, and President Salva Kiir has declared a night-time curfew. The Foreign Office has temporarily withdrawn some staff and dependants from the British embassy in Juba. Some commercial flights have resumed at Juba airport. A Foreign Office spokeswoman said: "To date over 150 British nationals have contacted us, many of whom want help leaving the country." These included some non-embassy staff, the spokeswoman added. The Foreign Office said its embassy in Juba remained open although the situation was being reviewed on a "constant basis". It has advised against all travel to within 40km of South Sudan's northern border with Sudan, Jonglei State and Juba, and all but essential travel to the rest of South Sudan. President Kiir has accused ex-vice-president Riek Machar of staging the coup - a claim he denies. The UN called for political dialogue to end a crisis that has left hundreds dead and sparked fears of a civil war. On Wednesday, Mr Kiir said he was willing to enter into talks with Mr Machar but that he did not know what the result would be. The United Nations has estimated that up to 500 people have been killed in fighting between rival factions following a coup attempt against the president by soldiers loyal to his former deputy. 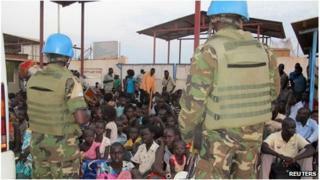 Secretary general Ban Ki-moon said that about 20,000 people had taken refuge with the UN in Juba. British nationals wanting to leave Juba should contact the Foreign Office as soon as possible on +44 207 008 1500 or by email at crisis@fco.gsi.gov.uk. Image caption In the Sudanese states of Khartoum, River Nile, and Gezira states, two-thirds of people have access to piped drinking water and pit latrines. In South Sudan, boreholes and unprotected wells are the main drinking sources. More than 80% of South Sudanese have no toilet facilities. Image caption Conflict and poverty are the main causes of food insecurity in both countries. In Sudan, many of the residents of war-affected Darfur and the border states of Blue Nile and South Kordofan depend on food aid. The UN said about 2.8m people in South Sudan would require food aid in 2013. South Sudan: What is the fighting about?